When our suppliers offer us a discount, we can offer you an even bigger discount! Below are a few temporary price reductions currently in effect. They can expire at any time, so order ASAP. Trimmed to 4x9 flat. Prices include FREE initial graphic design* and FREE standard shipping. 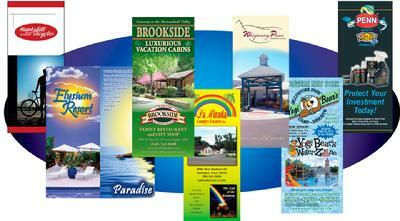 Printed on two sides in brilliant full color, on 100# gloss white text with medium-gloss AQ coating. Trimmed to 11x8.5 flat, tri-folded to 3.66x8.5. Prices include FREE initial graphic design* and FREE standard ground shipping. Ask about other quantities and lots of other formats and sizes! 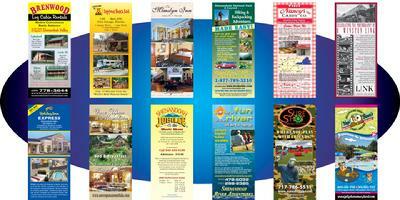 Printed on two sides in brilliant full color, on 14-pt. cardstock, with high-gloss UV coating on the front and no coating on the back. Trimmed to 4x6 flat. Prices include FREE initial graphic design* and FREE standard ground shipping. Ask about other sizes and quantities! 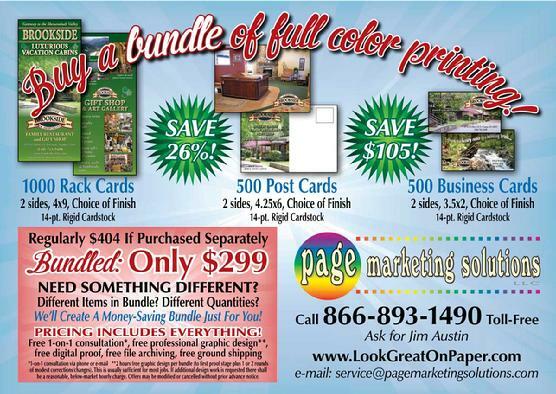 Printed on one or two sides in brilliant full color, on 14-pt. stock, with high-gloss UV coating. Trimmed to 3.5x2 flat. Prices include FREE initial graphic design* and FREE standard ground shipping.